[119 Pages Report] automotive ceramics market was valued at USD 1.51 Billion in 2016 and is projected to reach USD 2.05 Billion by 2022, at a CAGR of 5.2% during the forecast period. In this report, 2016 has been considered as the base year and the forecast period has been considered from 2017 to 2022. The automotive ceramics value chain includes automotive ceramics manufacturers, such as Kyocera (Japan), CeramTec (Germany), NGK Spark Plug (Japan), CoorsTek (US), and Morgan Advanced Materials (UK), among others that manufacture automotive ceramic materials, such as alumina oxide ceramic, titanate oxide ceramic, zirconia oxide ceramic, and others. These material are used by automotive parts and component manufacturers to develop various types of automotive parts and components, such as spark plugs, glow plugs, catalytic substrate, brakes, etc. that are further used in automobile manufacturing. This report categorizes the automotive ceramics market on the basis of material, application, and region. The automotive ceramics market is expected to grow from USD 1.59 Billion in 2017 to USD 2.05 Billion by 2022, at a CAGR of 5.2% from 2017 to 2022. Automotive ceramics find application in various automotive applications due to their unique properties. Contrary to conventional materials (metals & plastics), automotive ceramic products are lighter in weight, durable, and have better corrosion resistance properties. These factors are expected to drive the automotive ceramics market during the forecast period. The automotive ceramics market has been classified on the basis of material into alumina oxide ceramic, titanate oxide ceramic, zirconia oxide ceramic, and others. Among materials, the zirconia oxide ceramic segment is projected to grow at the highest CAGR during the forecast period. Zirconia oxide ceramics are known to have very high resistance to crack propagation and, hence, are preferred over other ceramics for applications requiring superior properties. Automotive components manufactured from zirconia oxide ceramics are expensive than other oxide ceramics. Owing to properties such as their high density, high fracture toughness, high flexural strength, and high chemical resistance properties, leading market players prefer zirconia oxide ceramics to manufacture automotive components and parts. 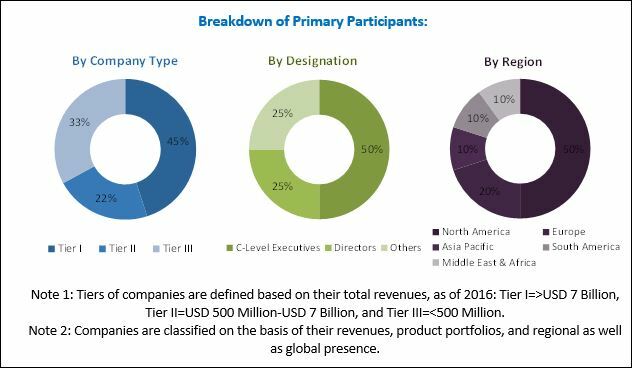 On the basis of application, the automotive ceramics market has been classified into automotive engine parts, automotive exhaust systems, automotive electronics, and others. The automotive engine parts application segment is projected to lead the automotive ceramics market during the forecast period. The growth of this segment can be attributed to the increasing use of automotive ceramics in spark plugs, glow plugs, high-pressure pumps, electronic fuel pumps, valves, sealing & insulation rings, and others. The automotive electronics application is projected to grow at the highest CAGR between 2017 and 2022. The Asia Pacific region is the largest market for automotive ceramics. The automotive ceramics market in APAC is projected to grow at the highest CAGR between 2017 and 2022. This growth can be attributed to the presence of various key manufacturers of automotive ceramics in the region. The automotive ceramics manufacturers are shifting their base to this region mainly due to developing local markets and greater manufacturing competitiveness of growing APAC economies. The growth of the APAC automotive ceramics market is mainly driven by China, South Korea, and Japan. The demand for these ceramics in China has increased exceptionally and is expected to witness growth in the near future, owing to the continuous shift of the production facilities to this country from around the globe. The major factor restraining the growth of the automotive ceramics market is their high cost as compared to their metal and plastic alternatives. 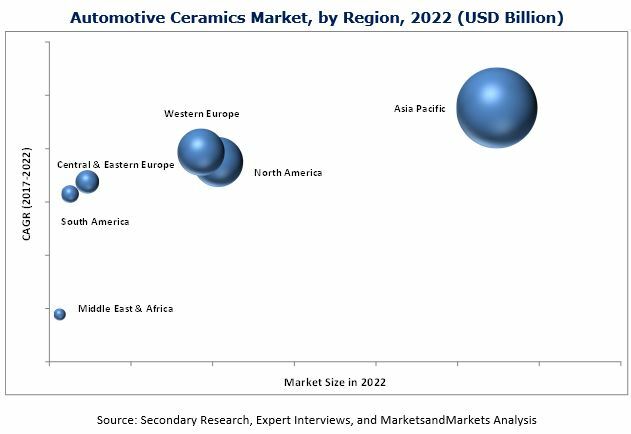 Some of the key players operating in the automotive ceramics market are Kyocera (Japan), CeramTec (Germany), NGK Spark Plug (Japan), CoorsTek (US), Morgan Advanced Materials (UK), Saint Gobain Ceramic Materials (US), IBIDEN (Japan), Ceradyne (US), and Corning (US), among others. Competition among these players is high, and they mostly compete with each other on the prices and quality of the products, their product portfolios, after sale services, and customized solutions, among others. 10.11.7 Blasch Automotive Ceramics, Inc.